If you like to cook, you probably use your oven a lot. You want your oven to work when you turn them on, but it's frustrating when you push that on the button and the oven doesn't heat up properly. Heating elements are tough and often last as long as the oven. But as with anything, parts can go wrong. If an oven is used often or an element has grease spattered on it, either of these can shorten an element's lifespan. You know it's the heating element if it's not glowing when you turn the oven on. A bad element may have a large burn mark or it may break. Most electric ovens have two elements: A bake element located in the bottom of the oven and a broil element located at the top. The good thing is, it's not hard to replace the heating elements. And it's a lot cheaper than buying a new oven. You could call in a professional, but as long as you have a screwdriver, you should be able to do this yourself. First, you'll need to figure out which part you'll need. Check your owner's manual to get the part number on the element. If you don't have the owner's manual, find the manufacturer and model, which is usually located in a visible spot on the oven, and look up the element number from that information. Make sure you have the correct number and order the part. 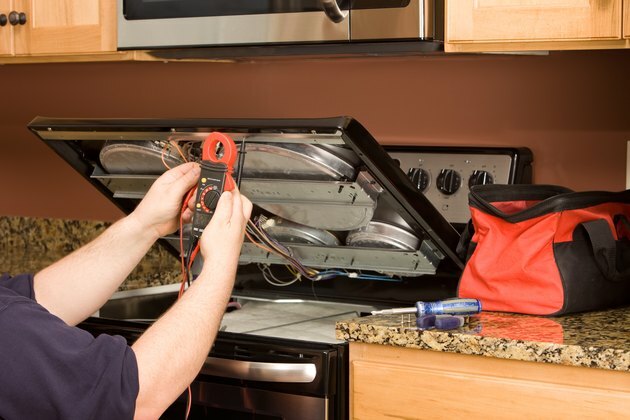 You shouldn't have any trouble finding a replacement part for your oven, even if it's an older model. Warm the oven first. Once the oven is slightly warm to the touch, turn it off. Warming up the oven makes it easier to remove the element correctly and prevent it from shattering. Then, flip the circuit breaker switch to turn off power to the oven. Check to see that the breaker is off, then unplug the oven. Once the power source is safely cut off, you can proceed. Wearing gloves, remove the mounting screws that keep the element in place. Gently pull the element a few inches away from the back wall of the oven, just until you can see the electrical wiring to the element. Then, remove the screws that hold the wires to the prongs on the element. Take note of the way the wires are attached. Remove the old heating element from the oven and put it aside. Then, place the new element into the oven. Take care to re-attach the electrical wires to the new element the same way they were attached to the old element. Using the same screws, screw the new element into position. Make sure the new element is secured to the back wall of the oven. You want to make sure your new element is working. Plug the oven back in, and turn the circuit breaker back on. Then, warm the oven, opening the door to see if the element is heating. Once you see that it is working, your oven should be ready to be used again. You can repeat the steps if you are replacing the other element in your oven.